The leadership of the National Association of Niger Delta Students NANDS, has endorsed the Senatorial ambition of Chief Micheal Johnny to represent Delta South senatorial district in 2019. 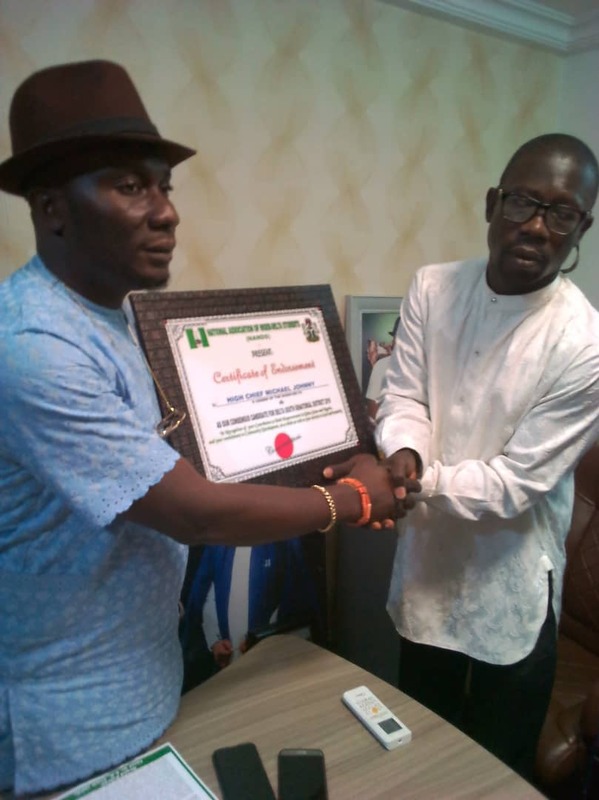 Comrade Lucky Omonefe, National President, who led a delegation of NANDS, while presenting an award and endorsement cerficate to Chief Micheal Johnny at his Ekpan residence, yesterday, said the endorsement was in recognition of Johnny's immense contributions toward youths empowerment, community development and service to humanity. The Students association promised to mobilize all eligible youths in Delta South senatorial to to cast their votes for Chief Micheal Johnny who is hopefully to emerge the APC Senatorial candidate for Delta South. Omonefe in his address said " NANDS nominated you for a prestigious award and also endorsed you as our choice candidate for the Senate, Delta South senatorial district in 2019. We have no doubt that your going to the Red Chamber is for the interest of the youths, development of communities in Delta South and most especially for the development of Gbaramatu kingdom, a highly respected kingdom in Niger Delta "
In his response, elated Johnny thanked NANDS for the endorsement, and assured the Students that he would clinch the APC ticket and win the general election, promising to provide effective, transparent representation and spread development across the communities in Delta South senatorial district.